As most traders already know by now, the European Securities and Markets Authority (ESMA) has enacted rather strict rules that among other things seriously limit how retail traders can trade Forex. The ESMA is a European Union regulatory authority and the rules affect not only the brokers based in Europe, but also all brokers who wish to deal with the EU residents. The only truly problematic one for traders is the leverage cap. According to brokers, many traders have actively employed full leverage in excess of 1:100. At the same time, it is probably one of the leading causes of many traders’ demise. Other changes are quite beneficial to traders — especially the information about percentage of losing traders at every broker. These numbers more than anything else tells about the actual trading conditions and order execution provided by the broker. The rules began to apply on August 1. The ESMA itself is calling them ‘temporary intervention measures’ because they are currently set to expire 3 months from August 1, i.e., on November 1. However, there is little indication that they will not be renewed. Especially, considering the fact that the ESMA has extended the initial 3-month ban on binary options for another 3-month period (through January 2, 2019). Obviously, the data should be taken with a grain of salt. First, only broker divisions regulated in Europe are counted here. For example, Exness has a nice low percentage of 47%, but it is calculated only based on the clients of Exness (Cy) Ltd registered in Cyprus and excludes the clients of Exness Limited registered in St. Vincent & the Grenadines. Second, the data is calculated every three months based on the previous 12 months of activity. Third, the numbers may not be telling much for brokers with too few clients to report on as some of the get lucky or unlucky through the period. You can look at the full list of brokers with respective percentage of losing traders if you want to see the raw data. I, personally, believe that the EU bureaucrats have put too much effort into enabling these trading restrictions to let go off them that easily. Brokers have also been made to spend lots of resources to enact the rules. There is also no significant public backlash against them. The situation is currently looks favorable for making the CFD rules permanent rather than abandon them. Update 2018-09-29: I have now closed the poll as the ESMA has decided to renew its CFD rules for another 3 months yesterday. Some minor changes have also been introduced to the rules, and the related Q&A has been expanded with an explanation about why the rules also cover spot Forex (which is not always traded via CFDs). Unfortunately, the majority of the blog’s visitors were wrong in their expectation that the ESMA will not renew its restrictions. 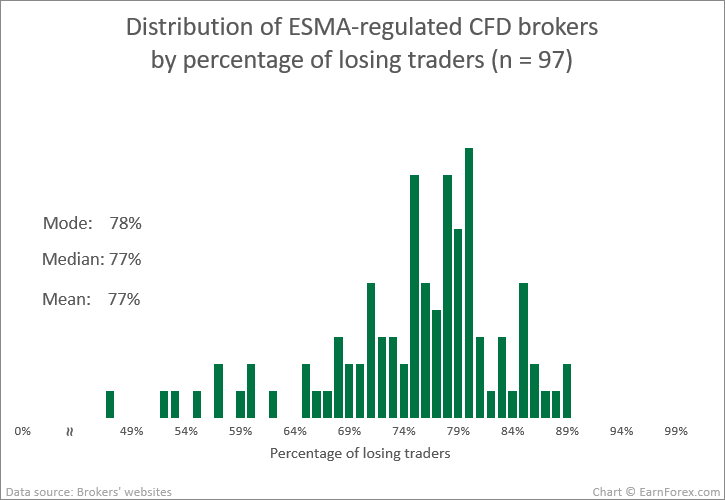 Will ESMA renew its Forex/CFD retail trading rules before they expire? If you have some opinion on the ESMA rules regarding retail Forex/CFD trading, feel free to share them via the commentary form below.